Pervious concrete paving at Glendale Park & Ride. As the valley of the sun continues its urban sprawl at an exponential rate, planners involved with the development of Maricopa County are faced with the inevitable overcrowding of roadways and the effects of such growth on the environment. The use of sustainable products in construction is becoming very popular and the City of Glendale, Arizona is seizing opportunities to use these products. A project known as the Glendale Park and Ride is one effort by the city to improve commuting in the west valley, as well as to give a boost to the environment. The concept of a park and ride is that commuters can park their cars free of charge and take a mass transit to their destinations. By providing commuters with a practical alternative to driving single passenger vehicles, they anticipate a reduction in traffic congestion around nearby facilities and as a result of fewer cars on the road, a reduction in pollution emitted by them. Amenities such as these are steps towards the balance of growth and environmental sustainability. Keeping in stride with the environmental qualities of the project, the planning team, composed of DWL Architects, Jacobs Edwards & Kelcey, and J2 Engineering, decided upon the use of ecologically friendly commodities with which to build. DrainScape™, also known as pervious concrete, jumped to the front of the list with its "no fines" mix design and beneficial attributes being relative to combating the urban heat island effect, recharging ground water and the reduced need for retention basins and treatment facilities. It is acknowledged by the EPA and LEED as an effective alternative to more traditional storm water management systems. The design of DrainScape™ is based on voids that allow for water and air to flow through the poured slab. By eliminating the sand that is in a typical concrete mix the void structure is left in the range of 15-30%, allowing for storm water to pass though at a rate of up to 8 gallons per square foot per minute and run directly into the subbase and ground soil. The initial appeal of this concrete usually comes from the replenishment of ground water; but upon further research, it has also been shown to aid in the control of pollution, such as fluid leaked from cars. In the first inch and a half of rainfall most of the roadway contaminates are flushed away to be distributed to canals and reservoirs. However, DrainScape™ is able to catch contaminates and effectively renders them chemically inactive. The aerobic quality of the voids in the concrete accomplishes this by allowing for microorganisms to breakdown the pollutants until they become inert, drastically reducing the impurities that would normally make it to waterways. The water that penetrates the pavement is the perfect replenishment of ground water. There are added benefits to a reduction of contaminated water being sent to waste treatment facilities such as, a cutback on chemicals used to treat the water, which is sympathetic to the environment and there is the potential to save tax payers money. 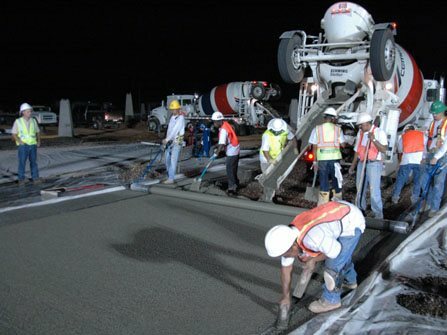 Progressive Hardscapes' crew poured the pervious concrete at night to avoid the heat of the day. The process of placing the concrete begins with a geotextile separator laid first atop the ground soil, followed by the placement of a six inch drainage layer of one inch rock that aids in the storage of water. Generally, the need for costly retention basins are reduced and underground containment is eliminated; due to the amount of water DrainScape™ (pervious concrete) is capable of holding. The capability of the concrete to hold water comes from a balance of the voids within the material. Comparable to a sponge, water enters the pores and trickles down to the soil at a slower rate because the channels it flows through are not simply wide open. The water is less likely to become backed up since it is introduced to the natural soil in small doses that are ideal for proper absorption. Never the less, the decision was made to add a retention pond, comparably smaller to those needed by traditional pavements, to catch any overflow that could possibly occur in the event of a severe storm. Seeming to have so many materials involved with placing the concrete, one would think that price must be astronomical. So at the request of the city, a 20 year cost analysis was done to find the difference between traditional asphalt and DrainScape™. The initial costs, as well as the projected maintenance cost were found to be less with DrainScape™, even with the final decision to add a sub drainage system and a retention pond. With all the benefits of pervious concrete, the City of Glendale found its ability to counter act the urban heat island effect (UHIE) very appealing. The urban area of Maricopa County has become what is known as a heat island; this means that the metropolitan area tends to have air and surface temperatures that are higher, by approximately fifteen degrees, than its surrounding rural area. A major cause is the thermal radiation emitted from concrete and asphalt materials used to pave roadways and parking lots. These materials absorb and retain heat in a very efficient manner, which during certain times of the year, especially in the Phoenix area, can cause brutal temperature increases. The effects of an elevated temperature are an increase in energy used to cool homes and businesses, an increase in heat related illness, an increase in water consumption, and altered weather patterns. On the forefront of the battle to find ways to lessen UHIE is a group of engineers form Arizona State University, the National Center of Excellence for Sustainable Materials and Renewable Resources (NCE of SMART). 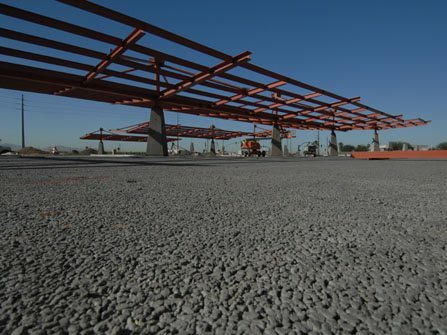 Due to their extensive research with pervious concrete they were a logical source of further information on the use of the material at the Glendale Park and Ride. The research they provided showed that the sun's heat that may be absorbed is cooled by the porous quality that allows for air and water circulation throughout the slab. The aerobic quality that allow for the concrete to maintain lower temperatures also helps to give plant life in the area that it is used, the water and nutrients they need to flourish. By an efficient form of cooling, evapotranspiration, thriving plant life helps to reduce the UHIE. Now that the product had been determined, the next step was finding the right company to install the concrete. An experienced company with a firm knowledge of placing this sensitive material is of the utmost importance to the final product. Progressive Hardscapes, based in Phoenix, seemed the obvious choice; having the credibility of being the first company in Arizona to be approved by the National Ready Mix Concrete Association and installing the DrainScape™ for the ASU Fine Arts Center parking lot, the primary testing grounds for the research of NCE of SMART. The construction schedule set the DrainScape™ pours during the hottest time of the year and, with day time temperatures well over the one hundred degree mark, the pours usually started around midnight. Placing the concrete when lowest possible temperatures are available is important due the fact that it is placed at a 0 slump. Screeding the concrete, cross rolling it, jointing and getting it covered in the small window of fifteen minutes is imperative to keeping it from curing too rapidly. 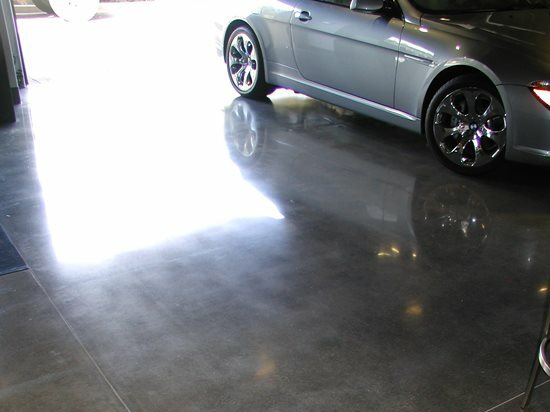 The concrete has to remain covered for a minimum of seven days to ensure that evaporation and air contact is minimal. At the Glendale Park and Ride, just fourteen days after placement, portions of the pavement were subjected to the heavy equipment used to place the canopies of the facility. There was some concern over the chances of raveling due to the pressure exerted on the concrete so soon after placement, but raveling was found to not be a problem. The placement and care of the concrete seems to have paid off in a product of great structural integrity. The Glendale Park and Ride currently has 392 spaces, with 254 spaces planned in phase two, which will be started if the City of Glendale finds there is a demand. With the growing movement of environmental awareness world wide combined with the increase in gas prices and the better understanding of the benefits of sustainable products, concepts like the Glendale Park and Ride are becoming more popular with both city planners and the general public. For further information of DrainScape™, as well as, videos and pictures please visit www.DrainScape.com.